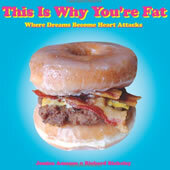 This Is Why You’re Fat: Where Dreams Become Heart Attacks is written by Jessica Amason and Richard Blakely. The book began as a website where anyone could post photos of the most extreme junk foods they could find. Due to the popularity of the site the book was created to show readers some of the high calorie and very unhealthy foods that people are actually eating. Why You’re Fat includes photos of foods such as a 7-pound breakfast burrito and a bacon cheeseburger served on a Krispy Kreme donut. Some of the foods highlighted in the book are those that were regarded as very occasional treats such as once a year at carnivals, which have now become regular indulgences for many Americans. This Is Why You’re Fat is not really a diet book but it can serve to increase awareness about the reasons why so many Americans are overweight. It can potentially help to educate readers about the dangers of eating large quantities of junk foods. The book doesn’t include advice about what to eat for a healthy diet and to lose weight. The primary focus is on what you shouldn’t be eating. It demonstrates the types of eating habits that are responsible for the obesity epidemic in America. For many of the featured foods the creators are interviewed so that readers can provide insight into their inspiration and reasons for wanting to eat them. Unfortunately almost half of the foods include recipes and instruction in addition to color photographs. This means that the book may actually encourage readers to increase their intake of fatty, sugary junk foods rather than avoiding them. This is Why You’re Fat does not recommend specific foods. This is Why Your Fat does not include a meal plan. Why You’re Fat does not address exercise as the primary focus is on exploring the various unhealthy food combinations that people eat. This Is Why You’re Fat: Where Dreams Become Heart Attacks retails at $9.99. Increases awareness about the foods that contribute to the obesity epidemic. Highlights the negative effects of junk foods on health. May inspire some readers to eat a healthier diet. May be entertaining for some readers due to the photos of unusual food creations. For some readers the photos may actually increase the desire for junk food. Some readers may find the images disturbing or repulsive. The authors fail to take either a positive or negative stance on the foods and recipes that are included in the book. Does not contain much more content than is available on the website. Does not provide information or guidelines on how to eat a healthy diet. Unfortunately This is Why You’re Fat is lacking on content and misses the opportunity to explore the reasons why so many Americans are eating such extremely unhealthy food. Despite the acknowledgment of the health risks associated with eating these foods, Why You’re Fat fails to offer readers any health or diet guidelines so that they are able to make the change to a healthier lifestyle. Additionally many readers may be triggered to experience cravings for junk food after viewing the photos. Furthermore the included recipes in This is Why You’re Fat can actually encourage readers to indulge in junk foods that can have an extremely negative effect on health.